This nicely remodeled Rocky Ridge vacation rental end unit it the very last on the edge of the national forest, enjoy peace and quiet of the mountain retreat. There is plenty of room, the unit features a spacious master suite, with a king size bed. Two guest rooms one with a queen bed and the other with two twins. There is also a small bonus room with a twin bed. There are two decks to enjoy the summer nights and in the winter you can sled, snowshoe or cross country right out the door. The main living area surrounds a huge rock fireplace and comfortable living furniture. The dining room seats 6 or more with additional chairs and there is wet bar near by for ease of entertaining. The kitchen has been updated to include granite countertops and new cabinets. There is a breakfast table off of the kitchen and a family room with a fooseball table. For your communication needs the unit is equipped with WiFi. The development is close to all that Tahoe City has to offer. Rocky Ridge is a gated community of 60 acres surrounded by State Forest Land, where you can enjoy nature on one of the many hiking or mountain biking trails just steps away. Amenities include 2 swimming pools, 2 spas ( one of which is open all winter long), tennis, basketball, playground, Bocce Ball court and a private beach with pier, buoys, BBQ facilities, clubhouse and volleyball court. Every vacation condo rental offers vaulted mountain-style ceilings, beautiful rock fireplaces, fully equipped kitchens, all set in an open two-story floor plan. This is the fourth time we have stayed at this property. It is convenient to friends who own a place in Rocky Ridge so that is a large motivating factor. I would characterize the place as appropriately appointed - it isn't high-end luxurious, but has all of what we needed between the kitchen/fireplace living room/bed-bath spaces. There is a nice foyer with spaces for wet shoes, ski equipment and pegs for coats. And it is at a reasonable price for a place of it's size. We enjoyed having a fire going throughout the afternoon/evening and the fact that the kids could have plenty of places to hang with their friends so we weren't on top of each other trying to enjoy our time in different ways. It had good wifi but a small tv - so if you're planning on watching a big game or a special show or movie, that might be a bit disappointing. 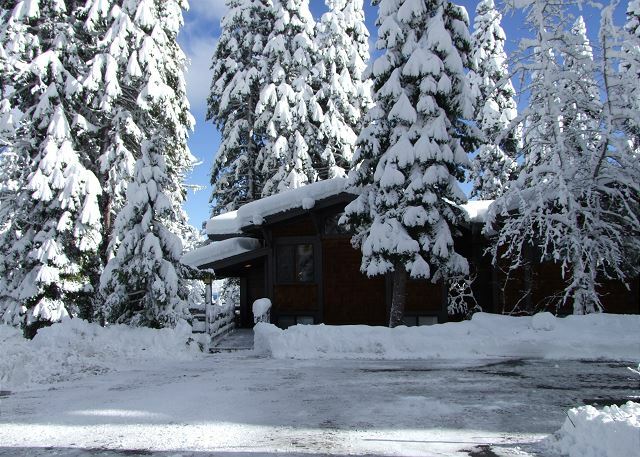 It abuts an open area with hiking/snowshoeing/X-country skiing right out the front door. Nicely located between Tahoe City and King's Beach so just a short drive to nice dinner places. No view from this unit, but you have a majestic view in a short walk to one end of the complex. We will go back I am sure.